Support the astronaut on her way to weightlessness! 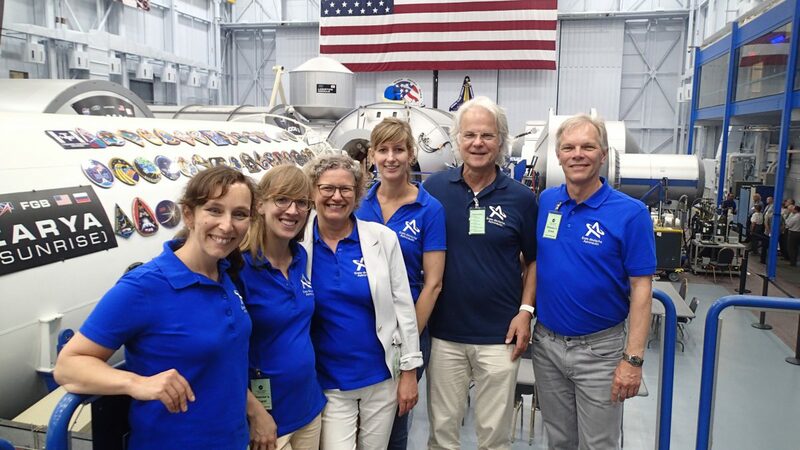 A team from “Astronautin” – the initiative set up to find the first German female astronaut and send her on a research mission to the ISS – travelled to the U.S. in mid-May. The group, which included the two trainee astronauts, visited the American companies Boeing, Axiom Space and SpaceX and toured astronaut training facilities of NASA. Bremen, Germany, May 30, 2018 – Preparing for a flight to the International Space Station (ISS) involves numerous different steps. With this in mind, the two trainee astronauts, Dr. Suzanna Randall and Dr. Insa Thiele-Eich, went on a ten-day fact-finding trip to the United States in mid-May. There, the astronauts and their team met with potential training, launch and mission partners from space companies to sound out the possibilities for one of them to travel to the ISS once her training is completed in 2020. At the top of the agenda were meetings with Boeing and SpaceX to discuss the various flight and collaboration options. At the facilities of aircraft manufacturing and space engineering company Boeing, located at U.S. space agency NASA’s Kennedy Space Center in Cape Canaveral, Florida, and NASA’s Johnson Space Center in Houston, the astronauts gained detailed insight into the production of the CST-100 Starliner crew capsule and the high standards applied in its construction. Another highlight was a visit to the crew access tower in Cape Canaveral, from which astronauts board the spacecraft prior to launch. SpaceX, one of the companies of entrepreneur Elon Musk, located in Los Angeles, showed the astronauts its Crew Dragon spacecraft along with the production facilities for the Falcon 9 launch vehicle and presented various scenarios for ISS missions ranging in duration from seven days to six months. SpaceX also mentioned lunar and free-flyer missions. The third remaining option for the journey to the ISS is the Russian Soyuz spacecraft, which is currently the only way people can reach the ISS. The German team will now thoroughly evaluate the possibilities and develop its “ideal” mission scenario. The astronauts’ U.S. visit focused not only on the transportation options to and from the ISS, but also on the preparations for space flight. This took them to space startup Axiom Space, which provides NASA-level astronaut training. They were given tours of all the training facilities and NASA’s Mission Control Center at the Johnson Space Center in Houston. Specific proposals were agreed upon for the next training modules, which could be implemented in 2019. To intensify the collaboration, follow-up meetings will take place in July and during the International Astronautical Congress in Bremen in October. Insa Thiele-Eich, who is expecting her third child at the end of October, plans to complete her pilot’s license this summer. Suzanna Randall, who joined the training program in February, will focus on studying space flight theory until the end of this year and also take her first flying lessons. Further training scheduled for 2019 includes obtaining or renewing the astronauts’ diving certificates, additional parabolic flights, and ISS training modules in Bremen, France and the U.S. The goal of the “Astronautin” initiative is to send the first German female astronaut on a research mission to the ISS. It is hoped the female astronaut will encourage women and girls to enter technical occupations and study scientific subjects. Her experimental program aboard the ISS is planned to include research into how the female body responds to weightlessness.